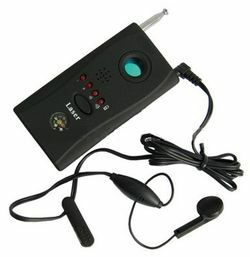 Are you concerned about being recorded or filmed without your knowledge?This wireless detector can detect hidden wired and wireless video, dead or alive, and has multiple alert modes including audible alarms, LEDs, and vibration. It locates bugs on frequencies from 100 MHz to 3000 MHz, and you can adjust the detecting sensitivity. RF detectors are simply radio frequency receiving devices.They are designed to detect wireless signals that are being transmitted within a certain frequency range. This unit detects 100MHz to 3.0GHz. Most surveillance equipment operates at 2.4GHz. Wireless transmitters vary in signal strength. Some are designed to transmit as far as three miles away, while others can only be received one room away. 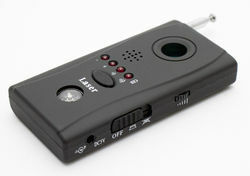 Micro spy cams are designed to output at low signal strengths to make them more difficult to detect. This device will need to be extra sensitive and the user may need to be nearly on top of the device. 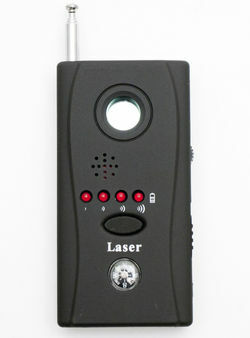 However, if the detector is too sensitive, it will give false alarms.